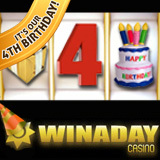 WinADayCasino.com has grown and changed a lot since it launched four summers ago but one thing is the same: the casino games are completely unique and only available at WinADay Casino. During the birthday celebrations this month the innovative entertainment site will launch another new game and is offering outstanding birthday bonuses. Today, Win A Day Casino has 31 unique instant play casino games , most of them connected to one frequently hit progressive jackpot which is currently approaching $100,000. Birthday celebrations began earlier this month with free chips and continue through the month with 50% Happy Hours this week and Father’s Day casino bonuses this weekend. A brand new game will be announced next week.